In May of 2016, the Centre was notified by the School Division that the school they had occupied since 1984 would be closing and their current lease would not be renewed. They were offered three classrooms at Royal School, which required renovations to meet Child Care Centre codes. The Centre had planned ahead for an emergency like this accumulating over many years an impressive emergency fund. 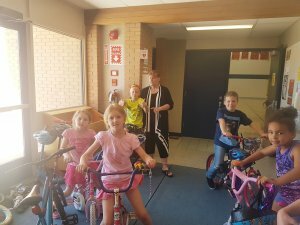 The savings however were not enough to meet the budget to upgrade the classrooms to Provincial licensing requirements. After lobbying efforts failed the Volunteer Board was pressed to continue to provide this important service to parents and the community. The Jubilee Fund was approached and through a loan guarantee with Assiniboine Credit Union, the renovations are complete and the low income subsidized spaces at the Child Care Centre were maintained.